Brackets Safir Pure 20 bucati Roth carlig 345, Slot 022"
Vizualizeaza catalogul pentru brackets 2012 click aici. - Slotul bracket-ului este polisat in prezenta caldurii si a diamantului, pentru o mai buna mecanica a arcului, fiind foarte rezistent la spargere sau fisurare..
- Este realizat din safir monocristalin cu un grad de transparenta foarte ridicat. - Baza bracket-ului este captusita cu pudra de zirconiu creand milioane de zone retentive pentru o mai buna adeziune cu compozitul de brackets Resilience Brackets Adhesive. - Carligul bracket-ului este neted si foarte puternic pentru a rezista la forta exercitata de elasticele intraorale. - Bracket-ul este prevazut cu un cod de culoare pentru o mai buna identificare a acestuia , care poate fi indepartat dupa ce bracketul a fost lipit pe dinte. - Baza bracket-ului este usor rotunjita pentru o mai buna aplicare / indepartare de pe dinte. 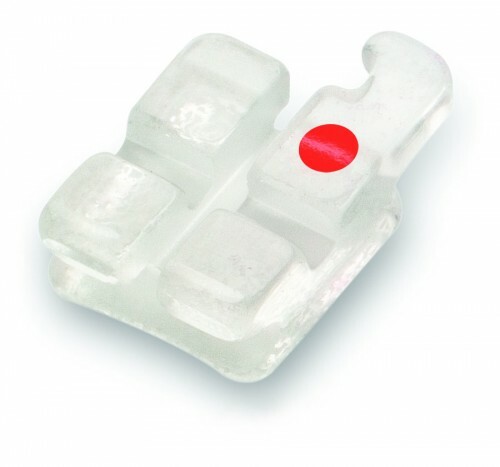 - Bracketii Pure sunt comparabili cu bracketii Inspire Ice de la Ormco. 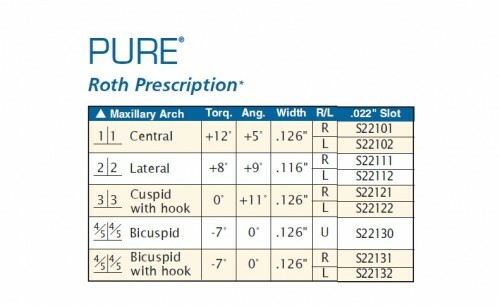 PURE® Patient Aesthetics - The macro photograph shows the clarity of the flawless PURE brackets. Made from pure monocrystalline sapphire for a bracket system with the highest transparency available for outstanding aesthetics. Nearly invisible against any tooth shade and stays crystal clear without staining. PURE® Bond Strength - SEM photographs show the unique Double Fusing Method™ (DFM). The PURE bonding base is coated with aluminum oxide spheres, increasing the bonding surface area, which allows for secure retention during the length of treatment and provides for predictable debonding at the end of treatment. 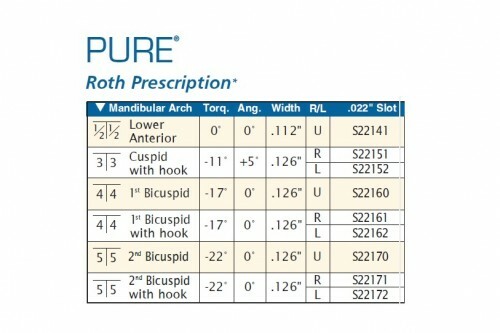 PURE® Contoured Base - The anatomically contoured bracket base allows for quick and easy bracket placement. The customized tooth specific design fits the tooth curvatures perfectly to increase bond strength and make bonding appointments a breeze. PURE® Predictable Debonding - Remove all ligatures and wires. Remove flash from around the brackets with a high speed debonding bur. Instruct the patient to bite down onto a cotton roll in the area brackets are being removed. Grasp the bracket with a straight or angled debonding plier at the bracket-adhesive interface. The bracket can be held along the occlusal-gingival or the mesial-distal edge. Gently squeeze the plier and gradually increase pressure until the bracket comes free from the tooth. Do not twist or pull the bracket. The bracket is designed to release at the bracket-adhesive interface and will leave a layer of adhesive on the enamel for safety. This means that most of the adhesive will remain on the tooth after debonding. Remove remaining adhesive with a high speed debonding bur or an adhesive removing plier. After bulk adhesive is removed follow up with a high or low speed enamel polishing bur.